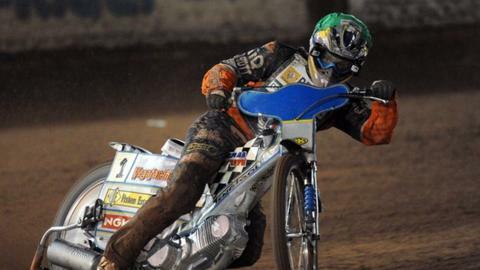 Wolverhampton Wolves fought back to run out 47-43 winners over Lakeside. The Midlanders were eight points behind with just three heats to go, before Freddie Lindgren and Tai Woffinden scored a maximum in heat 13 for Wolves. Ricky Wells' first place in the next heat helped them draw level, before Lindgren and Woffiden produced another maximum for the win. Wolves boss Peter Adams said: "I am pleased that we have won but we shouldn't have been in that position." He added: "From the position we were in with three races to go it was a fantastic result but having said that I am a purist and I am disappointed to have dropped a point." Wolves47: Freddie Lindgren 14+1, Tai Woffinden 13+1, Ricky Wells 8, Ty Proctor 5+2, Pontus Aspgren 5+2, Jacob Thorssell 2, Nicolai Klindt 0. Lakeside43: Peter Karlsson 12+1, Justin Sedgmen 8+1, Kim Nilsson 8+1, Stuart Robson 7+2, Davey Watt 7, Robert Mear 1, Jonas Davidsson R/R.